A terrific innovation in a single Pro DJ media player, the SC5000 Prime is armed with not one, but two actual deck layers, controlled by one unit and capable of beatgrid locked synchronization. The rear of the SC5000 has dedicated audio outputs for these layers (A&B) offering some incredible options for creative and forward-thinking DJs – you can drop an instrumental on layer ‘A’, with an a capella playing on layer ‘B.’ Or, how about looping a breakbeat on layer ‘A’ as your set end track, while handing off to a fellow DJ who’s scratching a sax sample over the top of the mix on layer ‘B’ – the possibilities are endless! 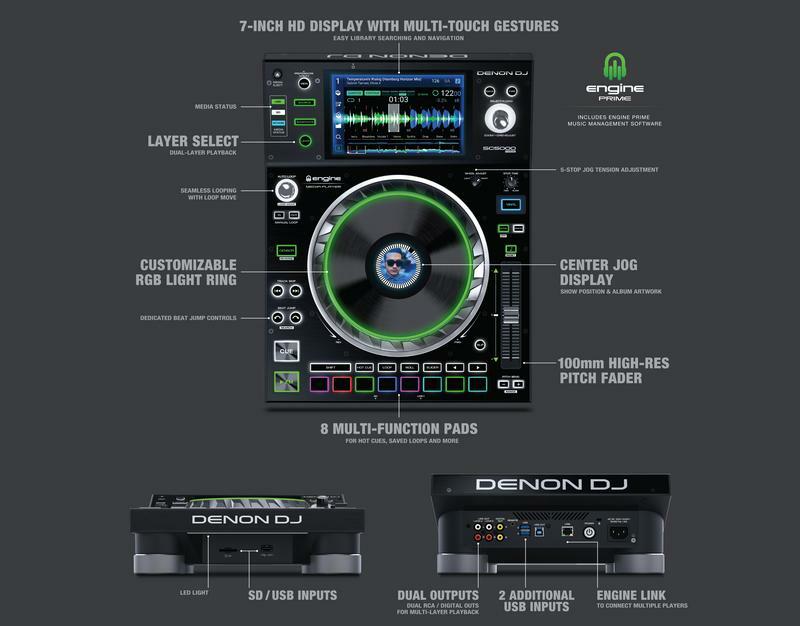 Denon have designed the SC5000 to give the DJ some extra help using layers. From changing the jog wheel and LAYER button RGB colour for each, to showing the track progress on the full waveforms next to each other, there are enough tools to help minimise the problems caused by layers. There’s also MIDI takeover on the pitch fader for when you’re beatmatching, meaning you can switch between decks seamlessly without fear of your tempo suddenly jumping. Powered by a dedicated, multi-core internal processor, the SC5000 runs ‘Engine Prime v1.2.’ This latest version of Denon DJ’s music librarian software is onboard the unit, offering you direct access and convenient performance features, so you can be at your creative best. The SC5000 doesn’t stand in the way of your creativity—it works with you and gets out of the way! Visual customization is highlighted by your choice of main primary colours for the SC5000 Prime’s 8-inch (touch-capacitive) jog-wheel LEDs, in addition to using your own DJ brand logo or selected track artwork on the beautiful central display. On the SC5000 touchscreen, elegant zoom-in and zoom-out of the big, beautiful track waveforms brings you to the pinnacle of musical timeline visualization.